Liverpool defender James Milner has put his side in front tonight from the penalty spot against Crystal Palace, scoring the only goal of the first half. Mohamed Salah was fouled in the box by former Red’s defender Mamadou Sakho and Milner stepped up to put Jurgen Klopp’s men into the lead in tonight’s Premier League clash at Selhurst Park. 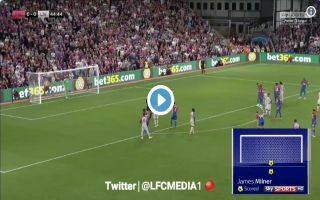 In a competitive first half of action, Salah wasted a fantastic chance to put Liverpool in front earlier in the game, dinking the ball wide when one on one with Wayne Hennessey in the Palace goal. Andros Townsend came closest for the home side, curling a fantastic effort towards the Liverpool net only to be denied by the woodwork. With the second half still in its infancy, this game is still very much in the balance and Liverpool must look to close out the game by scoring again rather than risk sitting back against a Crystal Palace side brimming with attacking talent.